In my travels through the region as a journalist, I’m constantly asked about the BVI’s rise in track and field. There are a combination of factors including the coaches preparing the athletes, but having a vision and being able to articulate it, then execute that vision, brings focus and clarity. When I became BVI Athletics Association President in December 2008, one of my aims was to see our athletes having the success that St. Kitts-Nevis and Grenada enjoyed in international competitions. After examining our record in regional and international competition and comparing with our regional counterparts, I realized that we lagged behind in our development. At the end of the 2009 season, an Athletes Awards Gala was introduced to recognize all our athletes, in track event, field events and not just the Youth, Jr. and Sr. Athletes of the Year. In 2010, we started to see a difference in performances but did not win any Carifta Games medals that year. At the start of my second stint as president, Dec 2012-2016, I presented the “Project Podium” concept. The aim of the Project Podium vision, was simply to win at least one medal in a major competition where we have neverwon a medal before, between 2013—2018. Not everyone bought into the vision, but, that didn’t deter the process. This plan was also shared with other sport administrators during the 2012 BVI Olympic Committee General Assembly., where I was voted out as Secretary General. With 2018 coming to a close, what has the Project Podium vision produced? Before unveiling the results of the vision, a reflection of the process is necessary. At that time in 2012, I asked how do we convert the athletes who have been Carifta Games/CAC Jr. Championships medalists into finalists/medalist at the other levels of competitions. Our counterparts from the Bahamas, St. Kitts-Nevis, Antigua and Barbuda, Anguilla, Grenada, Barbados and U.S. Virgin Islands for example, all of whom had athletes that had won medals at major international Youth/Junior competitions, after earning Carifta medals. The advent of the Youth Olympic Games in 2010 and the planning, triggered the first steps in Project Podium—identifying all 10-14 athletes on Clubs in 2012, who would meet the IAAF Youth criteria as 16-17 year old’s in upcoming competitions between 2015-2018. 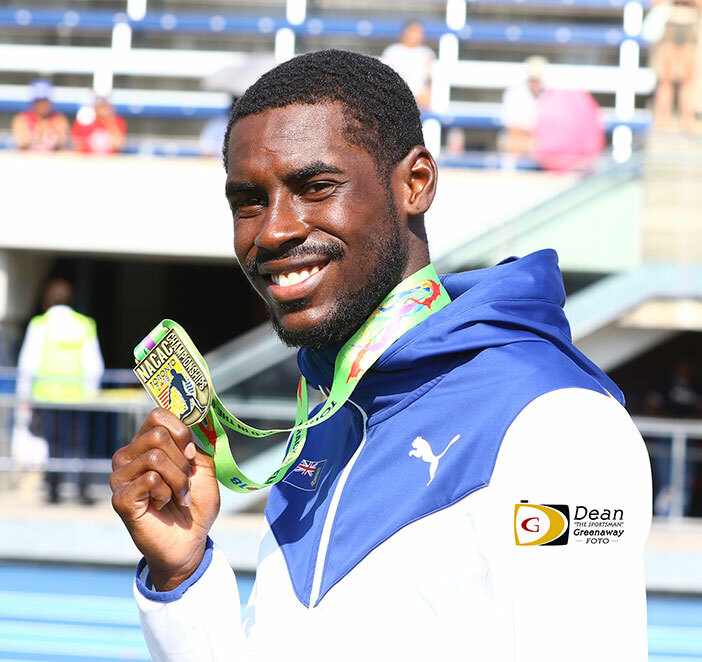 Those athletes would be pooled in all the respective competitions through the senior levels, with the aim of winning a medal in a major competition outside the Carifta Games and CAC Jr. Championships, during the 5-year span. These competitions included: the 2015 and 2017 Commonwealth Youth Games; IAAF World Youth Championships; 2015 & 2017; IAAF World Jr. Championships, 2016 & 2018; Pan Am Jr. Championships, 2015 & 2017; the Youth Olympic Games, 2018; the NACAC Championships, Pan American and Commonwealth Games, 2015 and 2018. Between 1978 and 2012, the BVI had won 25 medals at the Carifta Game. For the 20-year period 1992-2012, 15 medals have been won in CAC Jr. Championships competition. In between winning medals in those competitions, the BVI has been participating in the Pan Am Jr. Championships in 1986; the inaugural IAAF World Jr. Championships also in 1986 and the inaugural IAAF World Youth Championships in 2003. Excluding Games and the World Indoor Championships, unlike our regional counterparts whose athletes have won medals at the Carifta Games and CAC Jr. Championships, and converted several of those medals into medalists in competitions noted above, while we and had not positioned ourselves to do so, by producing semifinalists and finalists. The goal over the 5-years (2013–2018) was to first produce finalist, then to win a medal in one of the competitions listed above at the junior or senior competitions where we have never had an athlete standing on the podium. Although in 2012 we had been participating in the Pan Am Jr. Championships for 26 years, we have only had two finalists, Samantha John (800m) and Ashley Kelly (400m) in 2009 where they finished 5thand 7threspectively. Over the same period, participated in the IAAF World Jr. Championships and have had on finalist, Chantel Malone in the 400m and Long Jump where she was 8thand 4threspectively, in 2010. From a statistical analysis in 2012, we earned 25 Carifta Games medals, but if we use 1986 as the benchmark when both the Pan Am Jr. and IAAF World Jr. Championships were inaugurated, the number drops to 23 medals. We have had finalists in 71% of the competitions, but only won medals in 28% of those competitions over the same period. Our medal tally showed that we have garnered medals in 50% of events in which we compete overall and 28% among or Youth and Jr. athletic events. Of those 25 Carifta Games medals we won between 1978 and 2012, we had 25, but from 2013-2018, athletes have earned 26 medals. In the process, the BVI dethroned Grenada to become the OECS Track and Field Champion in 2016 and defended their title in Grenada, in 2017. With 2018 coming to a close, what has been the results of the Project Podium vision? Six medals won in five different competitions—including five individual medalists—where we hadn’t earned hardware before. 2013—The team of Taylor Hill, Nelda Huggins, Jonel Lacey and Tarika “Tinkerbell” Moses with Lakeisha “Mimi” Warner who ran in the semifinals, won an IAAF World Youth Championships Medley Relay silver . 2015—Chantel Malone, NACAC Sr. Championships Long Jump silver. 2016—Kyron McMaster, IAAF World Jr. Championships 400m Hurdles bronze medal. 2017—Beyonce DeFreitas and Djimon Gumbs, Commonwealth Youth Games silver and bronze medals in the 200m and Discus Throw events respectively. 2018—Kyron McMaster, the XXI Commonwealth Games 400m Hurdles gold medal. I’m most certain, that if other sports administrators in 2012 had even considered what the BVI Athletics Association was embarking on and embraced the concept which I was willing to share, the development of sports across the board since then, would be quite different today.